Get Inspired. Unleash Your Creativity. By Colors. Innovative design approach, opening a new dimension for commercial paints usage and setting a standard for interior design real colors matching during the planning phase. Professional graphic design tool offering innovative colors sampling and analysis using the mobile device. Ability to export data to other design applications for further utilization. High accuracy measurements capabilities for various industrial and scientific use cases, obviating expensive colors measurement equipment. We are on a constant exploration of new markets. Color measurement is being widely used in numerous use cases, we will offer an affordable solution to answer many of them. 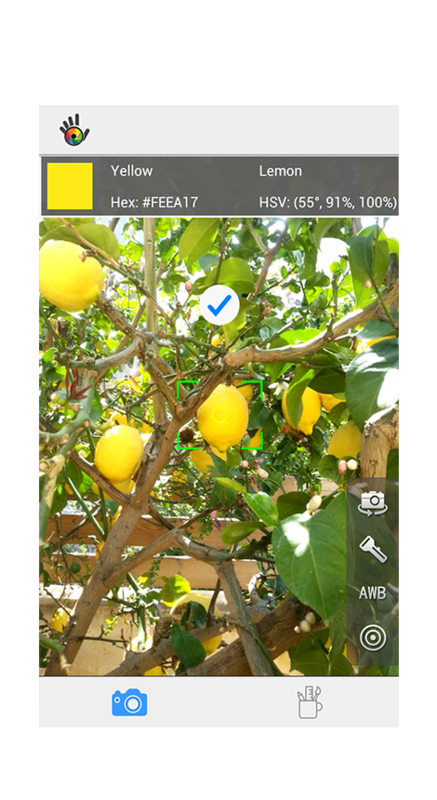 "Capture and save real-world colors in your smartphone"
Color Grab is a color capturing app that make it easy to digitize colors from the real-world around you using the smartphone. Find the perfect color combinations for your designs. Create an endless number of palettes based on popular colors-matching schemes. Export colors to your projects in your favorite design applications, such as Photoshop, CorelDRAW, GIMP, Inkscape and AutoCAD. Extract any color from your photos and find out what colors palettes your photos are composed from. A great way to start a design. 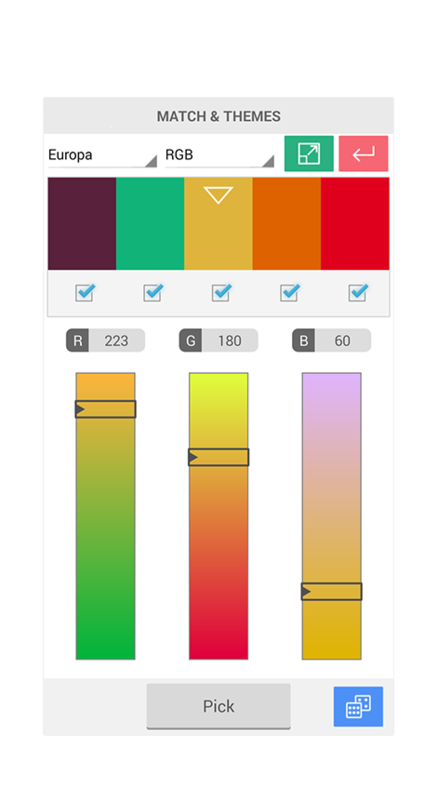 The most precise and powerful color analysis tool in the mobile industry! Test us. Supporting almost any color representation model (RGB, Hex, HSV, HSL, Lab, etc.). Choose your preferred model. Color Grab is totally free for commercial and non-commercial use. What are you waiting for? Go and grab it now. 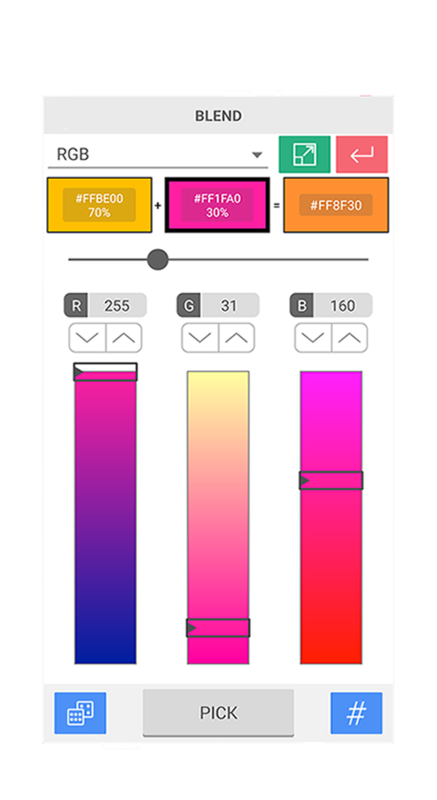 Color Grab is a portable color digitizer app that make it easy to capture colors wherever you see them in the real-world. 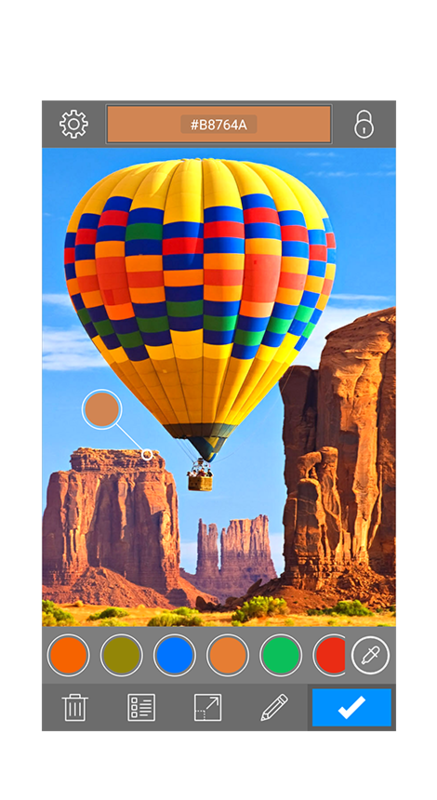 The app is built to be easy to use and works in real-time; just point your smartphone's camera to any color you wish to capture, tap the screen and the color is picked instantly. Unlike other color capturing solutions, Color Grab lets you pick colors from anything and not just solid surfaces, that's without any direct contact or external accessories, for example, sky, sunset, fluids, water, fish in aquarium, gases, soil, monitor’s screen, ambient light or any far unreachable objects. Color Grab includes built-in tool for extraction of colors and palettes from photos. The tool lets you pick single colors seamlessly with full support in smart gestures. In addition, it can automatically calculate the color palette (or color map) that your photos are composed from. This is a great way to start a design based on any photo. Get instant inspiration and avoid the hurdles of finding the proper color compositions. This is a must-have tool for designers who are working with colors and need to get bursts of inspiration from the world. 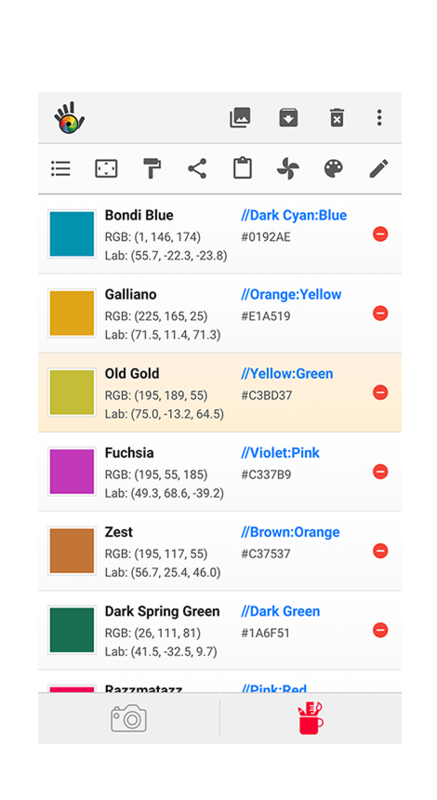 Color Grab lets you store unlimited number of colors and access them whenever and wherever you like. Pick colors while you are out and use them later while you are in the office. All colors are organized in the app and can be quickly accessed and analyzed. Color Grab also has the ability to export colors to your projects in your favorite design applications, such as Photoshop, CorelDRAW, GIMP, Inkscape and AutoCAD. Build your library of colors. Use them anytime, anywhere. You have found an interesting color, what's next? How are you going to use this color in your designs? Which colors shall be combined with this great color? The perfect creation requires the perfect colors harmony - like an amazing concert. Color Grab lets you find the best color compositions based on color theory. Create an endless number of palettes based on popular colors-matching scheme. The app also includes additional unique and unfamiliar schemes. It is easy now to capture a moment of inspiration which will be accurately reflected in your design later on. Color Grab includes built-in tool for colors blending. The tool lets you mix two colors together in order to produce a third color. Each color can be set to separate blend factor that determines how much of the color is combined into the final product. The tool is great for creating a primary color with some tint of another color. Furthermore, it is convenient tool for calucalting what will be the product of two colors mixing - just as we played when we were kids. Color Grab lets you tune and create any color in order to get the exact color just as you wanted. 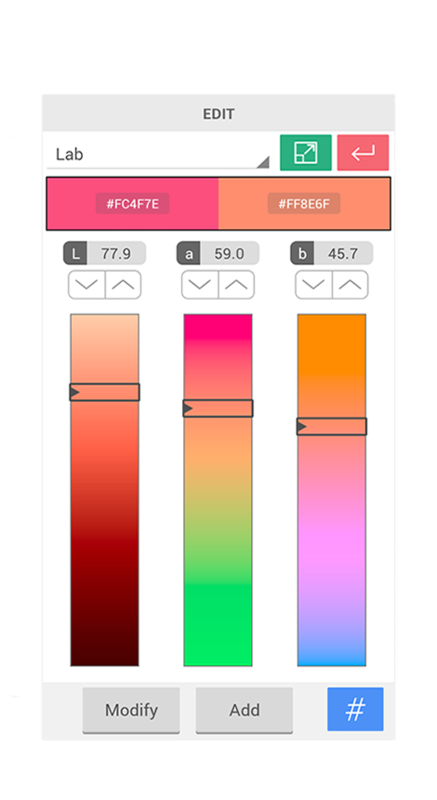 The app supports almost any color representation model, such as RGB, Hex, HSV, HSL, Lab and more. Choose your preferred model and adjust your colors in order to achieve perfection. We love developing our apps. Our users and the media have shown us plenty of love in return!